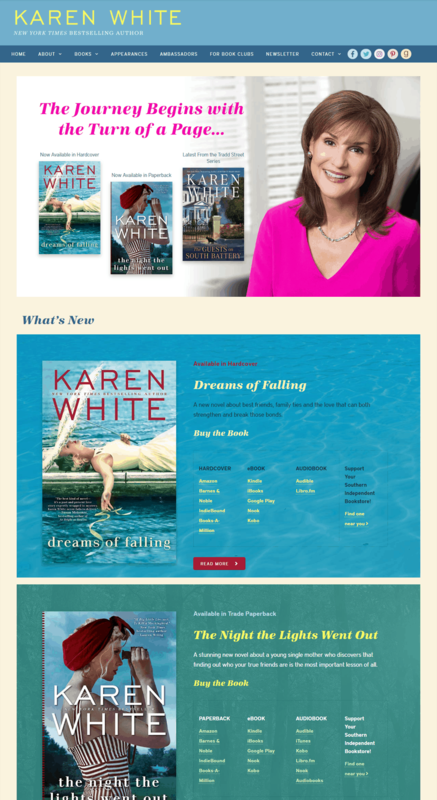 Karen White is the New York Times bestselling author of more than twenty novels, including the Tradd Street series, The Night the Lights Went Out, Flight Patterns, The Sound of Glass, A Long Time Gone, and The Time Between. She is the coauthor of The Forgotton Room with New York Times bestselling authors Beatriz Williams and Lauren Willig. She grew up in London but now lives with her husband near Atlanta, Georgia. I loved working with Carol Fitzgerald and her geniuses at Book Report Network for my website redesign. Not only were they professional AND personable, they knew their stuff. They made fabulous suggestions, and really spent a lot of time listening and reacting to my vision for the website, and then merging it with what would actually be the best course of action. They are proactive and knowledgeable so that I don't need to worry about reminding them when I have a new book coming out, or when new federal regulations stipulates wording on my mailing list sign up form. End result is a gorgeous and navigable website that I'm proud to share with readers. Highly recommend!